Here’s another easy learning English video that is also so inspiring! You will be glad you watched the video, I promise. The lesson is perfect for students at any English level. Beginners and pre-intermediate learners can use the transcript and subtitles for help. Step 1: Watch the video. Just click below on the screen to start the video. Step 3: Were the video and quiz hard? If so, don’t worry. Read the transcript. Or, watch the video with subtitles (in English or in your own language if available). Step 4: Leave comments. The best way to improve your English is to USE it. Okay, it's time to get started. Thank you. Two years ago, I stood on the TED stage in Arusha, Tanzania. I spoke very briefly about one of my proudest creations. It was a simple machine that changed my life. Before that time, I had never been away from my home in Malawi. I had never used a computer. I had never seen an Internet. On the stage that day, I was so nervous. There was a story I wouldn't tell you then. But well, I'm feeling good right now. I would like to share that story today. We have seven children in my family. All sisters, excepting me. This is me with my dad when I was a little boy. Before I discovered the wonders of science, I was just a simple farmer in a country of poor farmers. Like everyone else, we grew maize. 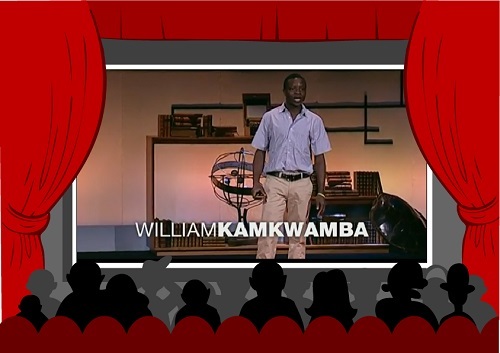 Share your thoughts about William Kamkwamba's TED Talk! - What did you think of the video? - What was interesting about his talk? - Were you inspired by his talk? How? Answer one of these questions or just share your any comments you have. We'd love to know what you think!